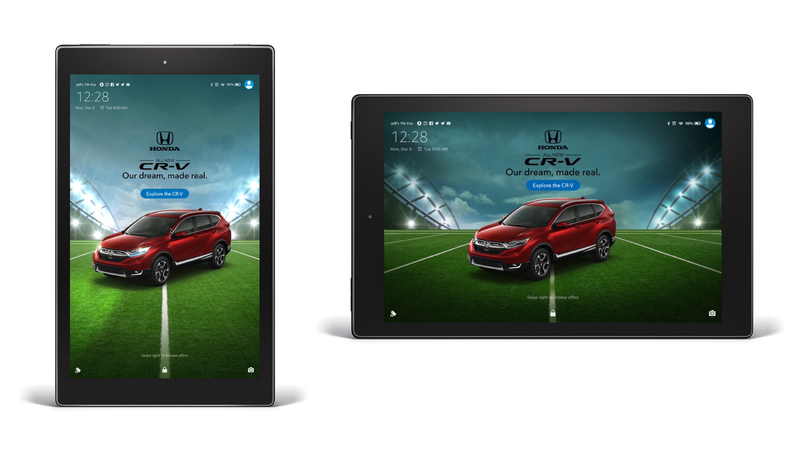 Honda CR-V x Prime Now "Upgraded"
In partnership with Honda and Buzzfeed, Amazon launched an “Upgraded” Game day experience on Amazon and Prime Now. 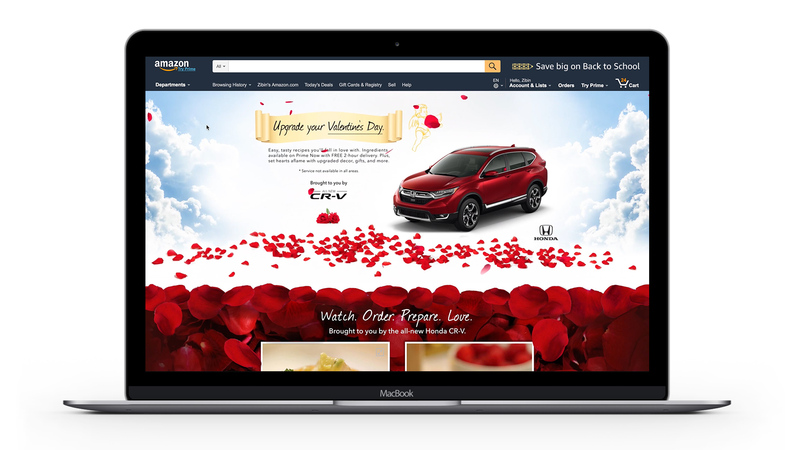 Courtesy of the all-new and UPGRADED Honda CR-V, Honda launched a custom advertising program with Prime Now sponsoring free 1-hour delivery from Jan 30 – Feb 5 2017, Branded Prime Now bags and a custom Amazon Landing Page. Customers can watch Buzzfeed’s Tasty Video Recipes on the landing page and click through to order the ingredients from Prime Now. All the exclusive video recipes are upgraded with unique twist. Customers can also find other Game-Day related products for purchase. After the Big Game, the Custom Landing page refreshed to be the Valentine’s Day-themed with related recipes and contents. AMG’s unprecedented direction of an all-new collaboration and co-promotion of a campaign is particular significant. 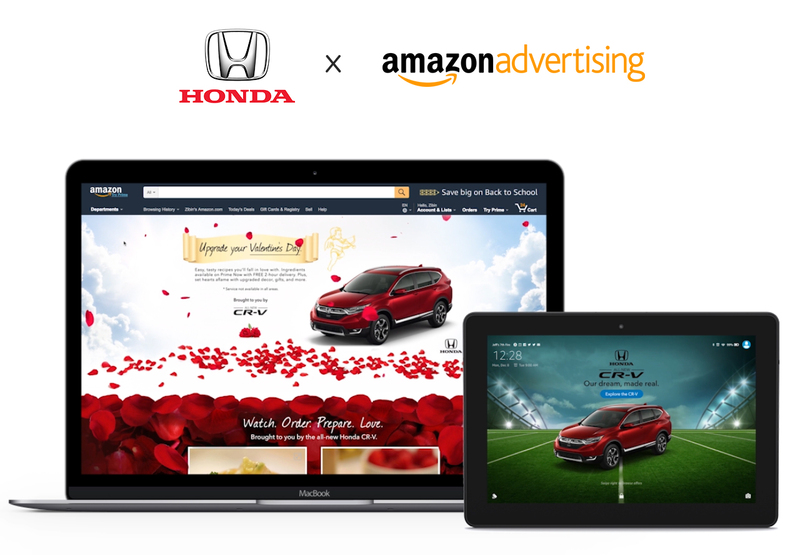 This was Amazon’s first partnership with Buzzfeed and the first time an automotive ad ran on Amazon’s homepage and Fire Tablet takeover for 8 full days. 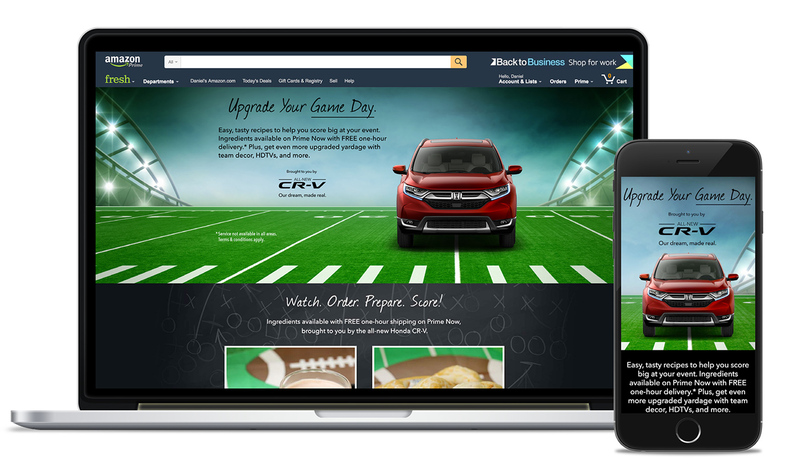 By implementing a strategy that included Buzzfeed, the campaign gained traction and impression, and coupled with Amazon’s high-customer visibility, effectively promoted the Honda CR-V advertisement and sale. As visual designer, I responsible for working with Art director to design and develop 2 Amazon custom landing pages (Big game and Valentine’s day), and work with Motion Designer develop the Animated Fire Tablet Wakescreen display poster.